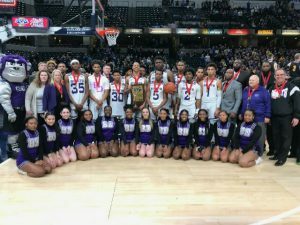 The 2019 IHSAA Finals reached its big finish on Saturday night as the Class 4A top-ranked Carmel Greyhounds outpointed the Ben Davis Giants 60-55 to claim the Class 4A state championship in boys basketball. Everything about this matchup coming in was big—starting with the schools being the state’s largest. Add in the featured on court duel between 6-10 Carmel center John Michael Mulloy (Butler) and Ben Davis (and future Ohio State Buckeye) offensive tackle/center Dawand Jones, and the setup was equally big. But, Carmel’s team defensive prowess weighed heavily on the outcome, as did Mulloy’s mobility on the floor. 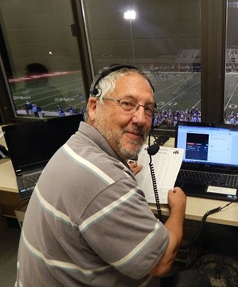 The Greyhounds were also the more balanced offensive side and the aggressor on the boards and the open floor. 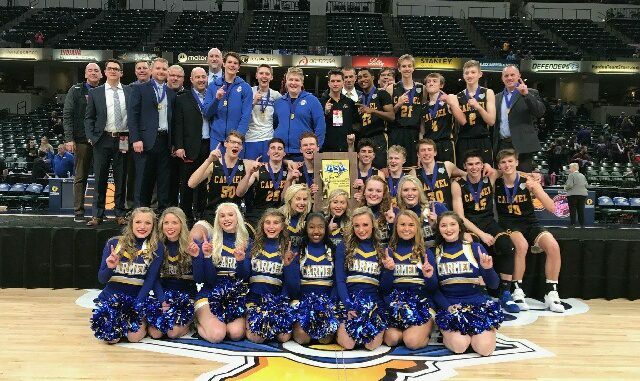 Carmel never trailed in the championship clash, and established some level of control in the first quarter on 7-0 run, with all seven points coming in less than a minute. Mulloy started that spurt by driving for a layup. Mulloy missed a bonus free throw, but freshman Pete Suder kept possession with the offensive rebound, which Andrew Owens paid off with an ensuing trey to complete the possession. Owens stole the ball back, and Suder ended Carmel’s possession with an inbounds basket after being fouled collecting an offensive board. The Giants would not go away, easily. Kai Hickman-Steinman hit from distance, while Jalen Windham was nearly perfect all night from the free throw line and Jones displayed some deft touch inside, as the Giants were down by a point, 31-30, at halftime. 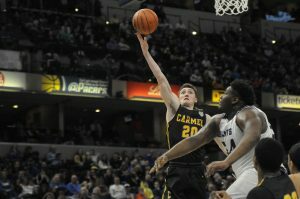 Carmel continued keeping Ben Davis at bay in the second half, extending back to seven points quickly as Owens scored an offensive put back and transition hoop. But, Windham countered with free throws and a feed to Jones, keeping the difference at one point. But, the Giants would get no closer, as Carmel focused its defense on limiting Windham and Jones down the stretch, with BD’s final hope ending in the closing seconds on Windham’s lone free throw miss after 13 makes. 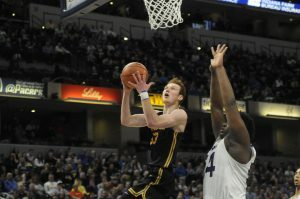 Mulloy, one of four Greyhounds in double figures, had 13 points and collected the Arthur L. Trester Mental Attitude Award after the contest. The lone freshman, Suder, paced Carmel with 14 points, while Owens had 10 and Karsten Windlan had eleven. 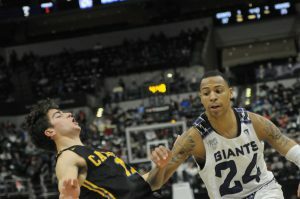 Windham led all scorers with 22, while Jones had 16 for the Giants.